BAM International bv has announced it will acquire Strukton International’s majority share in the joint venture Tidal Bridge BV. BAM’s remaining partner in Tidal Bridge BV in Eindhoven, the Netherlands, is Dutch Expansion Capital (DEC). The joint venture was established in 2015 for the realisation of floating power plants that convert tidal energy into electricity. In May 2017 Tidal Bridge started a feasibility study for the construction of a $225-million floating bridge on the Indonesian island Flores, the Palmerah Tidal Bridge project. 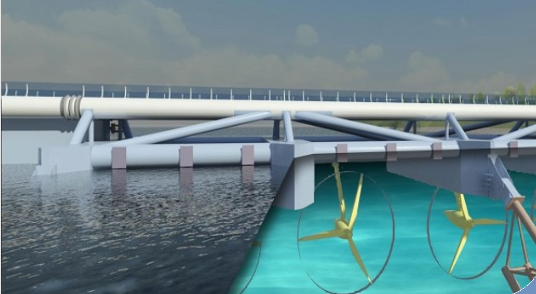 The project involves the construction of a floating bridge with the world’s largest tidal power plant connected to it. Turbines beneath the bridge will generate up to 30 megawatts from the tidal movements, providing electricity for over 100,000 people in the region. The share transfer is related to a strategic decision by Strukton to discontinue its activities in the Indonesian market. In a reconsideration of the strategy, the firm said it was decided that Indonesia will not be a home country for Strukton in the near future. BAM International, which has been active as a construction and infrastructure contractor in Indonesia since 1970, said it is the ideal partner for the realisation of the Palmerah Tidal Bridge project as well as the international dissemination of the Tidal Bridge concept. The acquisition is in line with BAM International’s strategic objective to maintain its position as market leader in international nearshore construction.